"By the British and Tories, the Declaration of Independence was called the death warrant of the signers. Had the first open [opponents] of the crown fallen into the hands of the royalists their lives would have been terminated in a summary manner. Among these was James Otis who was born at Barnstable, Massachusetts in 1725. He graduated at Harvard College when but eighteen years of age. He read law with Mr. Gridley, settled in Plymouth, and became one of the most brilliant lights of the profession. He was an uncompromising and fearless [opponent] of British wrongs, an able and unwavering advocate of American rights. In 1761, he appeared before the judges of the Supreme Court in defense of the people against the Writs of Assistance. His logic, eloquence and boldness astonished all who heard him. He insulated the people with patriotic fire that all the powers of mother Britain could never extinguish. Among others he was listened to by John Adams who often remarked, "Independence was then and there born." By the patriots of that day he was called the originator of the Revolution. He was the first man who placed his name to a bold and vigorous pamphlet which he wrote and published—exposing the innovations of the British ministry upon the chartered rights of the colonies. He was threatened with arrest which only roused him to more vigilant action in defense of human rights. He was a member of the Congress that convened in New York in 1765. During that year he wrote his "Rights of the Colonies Vindicated" which was a masterly production and published in London. He was of a warm temperament—impulsive—if hard pressed was sometimes harsh in his language. He was lashed severely by the ministerial organs which caused him to publish pungent strictures upon the conduct of several of the crown officers. Soon after these appeared he was attacked in a public room by a band of British ruffians led on by custom house commissioner Robinson, who nearly took his life. This occurred on the 5th of September 1769. So much was he injured that his reason soon fled forever. He may appropriately be called the first mover and the first martyr of the American Revolution. He obtained a judgment of $20,000 against Robinson for the base assault and on receiving a written apology relinquished it. His towering mental powers broke rapidly until he became a mental wreck. The repeated blows upon his head had permanently deranged his brain. Occasional lucid flashes would pass over his mind like brilliant meteors and pass as quickly away. He had often expressed a wish that he might be killed by lightning. That desire was granted on the 23rd day of May 1783 while leaning on his cane at the door of Mr. Osgood. His body was taken to Boston and buried with every mark of respect attended by an unprecedented concourse of sympathizing freemen. No patriot of the Revolution merits our reverence, admiration and gratitude more than James Otis. He commenced that opposition against tyranny which resulted in the emancipation of the new continent—prepared an asylum for the oppressed and set an example for patriots worthy of imitation through all future time and over the civilized world. The love of liberty and the oppressions of those in power, first induced the pilgrim fathers to plant their standard on the granite shores of New England. They were not a band of visionary unprincipled speculators, but a band of intelligent, virtuous, pious, patriotic and enterprising citizens, who were, from the commencement, willing to risk their lives and fortunes in the cause of human rights. The early forms of government adopted by many of those infant settlements, were remarkably similar to those now in operation. The principles that actuated the patriots of the Revolution were recognized and taught by many of the earliest immigrants. Although, in consequence of the charters emanating from the King, an allegiance was recognized, yet the people never intended to have those chains riveted upon them from which they had fled, nor surrender tamely the rights and privileges given them by the God of nature, and rendered more dear by years of toil and fountains of blood." The New Jersey Gazette of June 11, 1783 described the tragic death of James Otis: "Boston. May 26. We hear from Andover that last Friday evening the house of Mr. Isaac Osgood, was set on fire, and much shattered by lightning, by which honourable James Otis, Esq., of this town, leaning upon his cane at the front door, was instantly killed: Several persons were in the house at the time, some of whom were violently affected by the shock; but immediately recovering, ran to Mr. Otis's support, but he had expired without a groan." 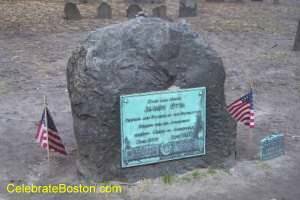 James Otis was placed in a tomb at Granary Burying Ground. As you enter the grounds, his large stone marker is on the far left of the first path.